Here's a centerpiece... Hmmmm... anyone have a recipe for a nectarine martini or cocktail? If so... bring it along! Please send me the invoice for the two paintings. How long will it take to ship them? You grow nectarines?! How wonderful! 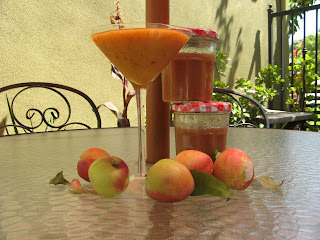 Nectarines are one of my favorite summer fruits. That smoothie looks yummy. 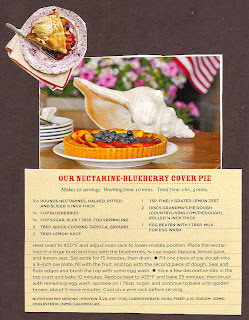 Oh Fifi, I LOVE nectarines! 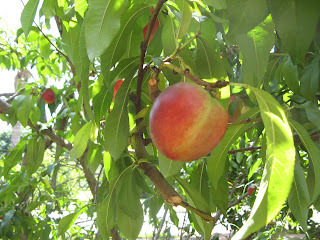 My favorite summer fruit, and I can't believe you have a nectarine tree. Lucky you! Love the paintings. Puts me in the mood to enjoy our nice warm weather. From what I can see it looks like you have a lovely yard too. I would SO come to your nectarine party! YUM - what time you serving drinks?! oh i love peaches and nectarines! 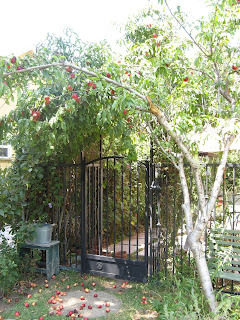 we're renting right now, but i have several fruit trees in mind for when we buy a house (cherry, lemon, plum, avocado...). you're one lucky fifi! That smoothie does look pretty dee-lish! Preserves! My favorite summer past-time! Just beautiful, why would they mind all the guests - the more the merrier they say. The picture with the flowers and urn - it's gorgeous. Mmmmm, the smoothie looks yummy! those nectarines look delicious! 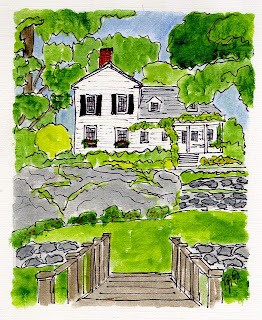 and the painting of the house is wonderful, I'm a big fan of all the green. Thanks for sharing your goodies with us, and beautiful artwork! Seriously, your blog is making me hungry! :) Love the art- would be perfect in a kitchen!!! A nectarine tree- how dreamy!!! Another post that makes me desperately want Summer to appear here very quickly! I love nectarines, but even more I adore peacherines - a truly angelic combo. of 2 of the best things in life. BUT... there's always next year!